On any canal cruise of Amsterdam’s waterways, you will come face to face with a gigantic green building jutting into the water and which looks like a ship’s hull. 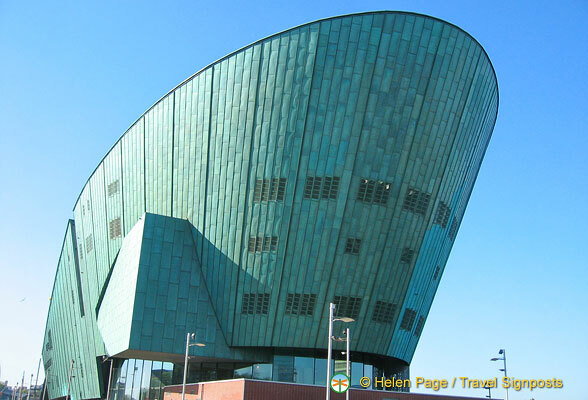 Meet NEMO, Netherland’s largest science centre, located about 15 minutes walk from Amsterdam Central Station. NEMO has approximately 5,000 square metres of exhibition space comprising five floors packed with interesting things to do and discover. Everything at NEMO is about science and technology – ever wondered what you will look like in 30 years, why you look so much like your parents – or don’t look like them, what happens when people kiss, how to purify water or how lightning and satellites work? Exhibits are interactive and educational and you will smell, hear, feel and see how the world works. It’s a fun place for the whole family and anyone with an inquiring mind. There are food outlets at NEMO and Café DECK5 has stunning views of Amsterdam city centre and its historic harbour. And at the NEMO shop, you can buy books, games, puzzles, experiment sets, bubble-blowing equipment, etc. NEMO Science Centre was designed by Renzo Piano and built above the IJ Tunnel which links Amsterdam to the opposite bank of the IJ. The construction itself is fascinating as the tunnel acted as the building’s foundations, during construction and the curve in the tunnel also became the curve in the building. According to some, when vehicles drive down into the tunnel it looks like they are driving into the hold of a ferry. Needless to say, the design of the building was tricky as it had to balance the weight of the vehicles going through the tunnel with the dimensions of the building. NEMO presents the world of science and technology in a fun and educational way for visitors and is definitely one of the things to do with children on any Amsterdam vacation. A visit to NEMO costs € 16,50 per person for visitors 4 years and above, however special tariffs and discounts are available for students on production of a student card.